The Leica L-Mount is a bayonet mount developed by Leica Camera AG for interchangeable-lens autofocus digital cameras. The L-Mount has an inner diameter of 51.6 mm and a flange depth of 20.0 mm. The L-mount exists in two versions, an APS-C version (TL) and a full-frame version (SL). The two versions are mechanically and electronically compatible. TL lenses mounted on full-frame cameras will cause the camera to use a crop mode from the center of the sensor, corresponding to the APS-C coverage of the lens. SL lenses mounted on TL cameras function normally, providing a 1.5x crop field of view, as is typical with APS-C cameras. In 2018 Leica formed the L-Mount Alliance, licensing Sigma and Panasonic to use an upgraded version of the mount for their own products, opening the way for a more extensive system of fully compatible cameras and lenses. It was introduced in April 2014 with the Leica T (Typ 701) camera. At the time of introduction, it was called the "T-mount", but this was changed to "L-mount" with the release of the Leica SL, a full-frame sensor camera using the same mount. The Leica T was renamed to the Leica TL at this time, to permit marketing clarity for the L-mount lens line: TL lenses would cover APS-C sensors, while SL lenses would cover full-frame sensors. The mount is used by the Leica TL (discontinued), TL2, Leica CL (2017) and Leica SL systems. The L-Mount is a registered trademark of Leica Camera AG. 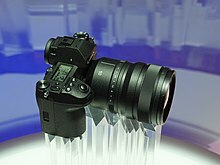 On 25 September 2018, the L-Mount Alliance between Leica, Panasonic and Sigma was announced, enabling the partners "to make use of the L-Mount standard developed by Leica for their own developments and to offer both cameras and lenses utilising this lens mount" with full compatibility between the three companies' products. According to Sigma CEO, Kazuto Yamaki, the "L-mount system is not exactly the same as the existing one. We updated it a little bit to work better with such lenses through lens adapters." On the same day, Panasonic announced its S1R and S1 full-frame L-Mount cameras and three L-Mount lenses, with seven more lenses to be launched by 2020. Sigma announced that it will launch a full-frame camera in 2019, using the L-Mount and the company's Foveon sensor, as well as a range of L-mount lenses and adapters for Sigma SA and Canon EF lenses. Six cameras and 39 native lenses are confirmed for the L-Mount by 2020. Leica T/TL cameras use APS-C sensors. The TL mount version is not dust- or splashproof. Leica SL cameras use full-frame sensors. The SL version is dust- and splashproof. Leica has an existing range of fifteen L-Mount lenses. Sigma plans to release a wide range of lenses. 14 primes from Sigma's 'Global Vision' range, primarily designed for reflex cameras with short flange depths and currently available for the mirrorless Sony E-mount, will also be released in L-Mount from 2019. These will be followed by a range designed specifically for mirrorless parameters. Manual third-party lenses are being produced in L-mount by 7Artisans (Photoelectric series), Meyer-Optik (Gorlitz series), and Kipon HandeVision (IBELUX and IBERIT series'). Sigma EF-L adapter Sigma-manufactured 'Global Vision' EF-mount lenses are fully supported and compatible; although non-Sigma EF-mount lenses remain unguaranteed. ^ Leica SL Details. Manufacturer's website. Visited 2 June 2017. ^ a b c d e f g h i j k l m n o p q r s t Etchells, Dave (2 October 2018). "Sigma interview at Photokina 2018: CEO Kazuto Yamaki gives us a peek inside the L-mount alliance". Imaging Resource. Retrieved 7 October 2018. ^ "New Leica TL System announced". Leica Forum Blog. 2016-11-08. Retrieved 2018-07-24. ^ Goldstein, Mark. "L-Mount Alliance Between Leica, Panasonic and Sigma Officially Announced". Photography Blog. Retrieved 25 September 2018. ^ Goldstein, Mark. "Panasonic S1R and Panasonic S1 35mm Full-frame Mirrorless Cameras". Photography Blog. Retrieved 25 September 2018. ^ Butler, Richard. "Sigma to take Foveon full frame and adopt L mount". DPReview. Retrieved 26 September 2018. ^ "Leica SL lenses". Leica Company Website. Leica Camera AG. Retrieved June 12, 2017. ^ a b c Keller, Jeff (September 25, 2018). "Panasonic developing two full-frame mirrorless cameras with Leica L-mount". DPReview. Retrieved January 25, 2019. ^ a b c "Panasonic Launches Three L-Mount Interchangeable Lensesfor the LUMIX SSeries Full-frame Digital Single Lens Mirrorless Camera" (PDF). Panasonic Global Website. Panasonic Corporation. February 1, 2019. Retrieved March 2, 2019. ^ "Adapter-Finder of Novoflex". Novoflex Company Website. Novoflex. Retrieved June 12, 2017. This page was last edited on 1 March 2019, at 18:55 (UTC).